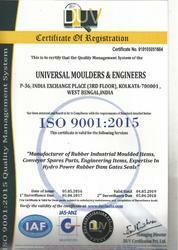 UNIVERSAL MOULDERS & ENGINEERS, established in 1971, popularly known a 'UME' based in Kolkata is known world-wide as most recognized Manufacturer, Supplier & regular Exporter of various Industrial Rubber Moulded & Extruded Products, Precision Engineering Products and Conveyor Spare Parts. We manufacture various types of industrial rubber moulded and extruded products as per customer drawing and material specifications in NATURAL RUBBER, VITON RUBBER, SILICON RUBBER, NEOPRENE RUBBER, EPDM RUBBER, NBR NITRILE RUBBER, SBR, TPR, ALFAS, HNBR, Polyurethane Rubber, BUTYL RUBBER & BIPRENE RUBBER. Our manufacturing capabilities, highly qualified staff and constant research of market demand permit us to expand our clients’ circle constantly and to consolidate relations with our long-term customers. Our Manufacturing units spread across an area of two acres, is the company’s state of the art manufacturing unit at Howrah, (Kolkata). Over the years, we have accumulated a wealth of experience and expertise that has earned us the reputation of being among India's leading manufacturers of Industrial Rubber products. With thrust on exports, our presence has been growing in the international markets. Our stringent quality systems have resulted in us being accredited with the ISO 9001:2015 certification. We manufacture the materials strictly as per IS, BS, ASTM & DIN specifications. Our position of strength has further been attained by our focus on R&D and Human Resource Development and above all, our commitment to customer satisfaction. Fulfilling their needs with value added solutions have always been our goal. QUALITY: The main goal of UME is to provide the highest quality of the products manufactured by our Company, the unconditional fulfilment of the requirements and expectations of our clients, as well as full compliance with quality standards and regulatory requirements for the products. Efficiently functioning Quality Management System ensures the highest quality of UME products, their competitiveness, as well as total elimination of risks for the Customers. UME Quality Management System is certified and comply the requirements of International Standard ISO 9001. Our Key Customers: With a prestigious clientele of over 1400 companies, we cover almost every sector of the industry as well as Government, Semi-Government, Private sectors like Ministry of Defence, NHPC, NHDC, NTPC, Coal, Mines, Nuclear & Aerospace Industry, Cement Plants, HVAC, Aluminium Industries, Chemical & Fertilizers, Ship Building Industries, Ammunition & Ordinance Factory, Civil Aviation, Hydro Power, Automobile Industry, Food & Beverages, Steel & Allied Industries, Pharmaceutical, Petro-chemicals, Thermal Power Station, Oil & Gas telecommunications and various other Industrial Sectors. The team at Universal Moulders & Engineers consists of Design and Product Engineers, R&D faculty, Quality Controllers, Laborers, Warehousing, packaging and logistic professionals and sales and marketing executives. Proficient in their respective domains, the combined efforts of the team have always been very instrumental in our continued success by consistently offering excellent quality products and services to the clients. We provide excellent remuneration, beneficial growth opportunities and motivated work environment to our employees. Along with it, they also undergo regular skill enhancement and technical trainings and people skills training to keep abreast with the latest technology and market trends. We are the pioneers in the Industrial Rubber Products and have been able to maintain our leadership in the industry.